The Forged Billet Dynalite has wide spread application over many forms over motorsports. It serves as the base model in the majority of Wilwood’s Bolt-On Disc Brake Kits. The latest applied developments and innovations in caliper design and manufacturing processes have resulted in substantial improvements in strength and performance over all comparable models. Forged Dynalites are the strongest calipers in the class, with weights starting at 2.80 pounds. The process of stress-flow forging re-aligns the metal’s grain structure within the contour of the caliper body. This process eliminates the breaks and interruptions to the internal grain structure that occur when machining a straight block billet. The FEA generated radial transition design eliminates steps and shoulders in the area between the piston housing body and the caliper bridges. Incorporating a radius in this transition area substantially increases resistance to deflection and caliper separation under load. Structural deflection and volume displacement tests have proven the Forged Dynalite to outperform all existing styles of this popular caliper size. Without even considering the overall greater strength and reliability of the forging, the reduced deflection tendencies and the resulting decrease in fluid volume displacement translate to increased clamping efficiency with less pedal travel. The bottom line is a taller pedal and better stopping power. 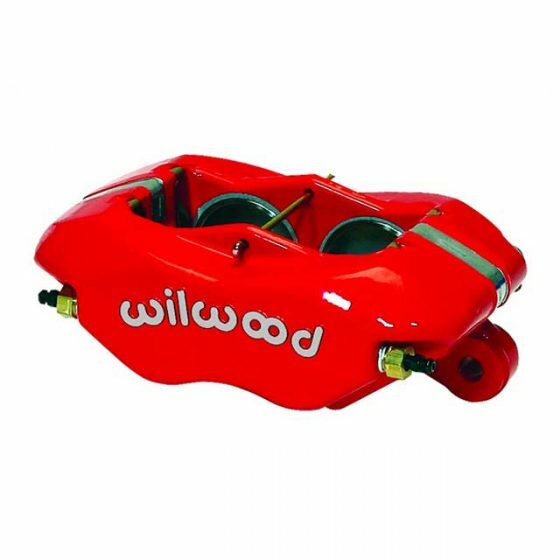 The superior strength of this innovative design is combined with proven performance features from Wilwood’s earlier designs. 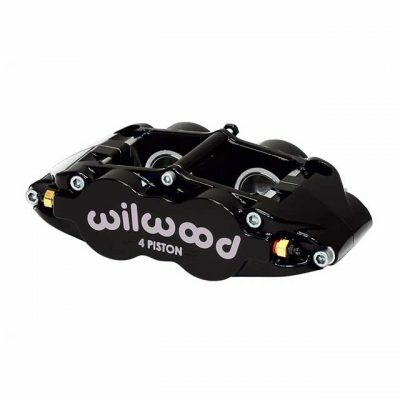 Each caliper is equipped with Wilwood’s SRS stainless steel bridge plates. 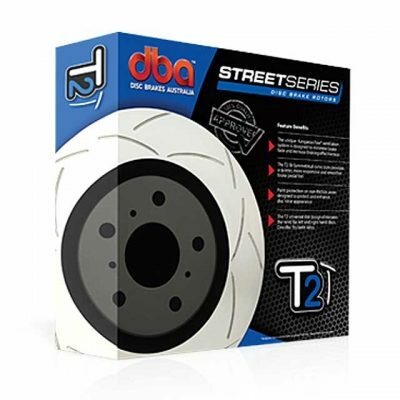 The SRS plates eliminate the bridge wear caused by pad gouging and extend the service life of the caliper body. The spring-loading action of the SRS plates also eliminates pad rattle and dampens the vibration harmonics that contribute to squeal under braking. 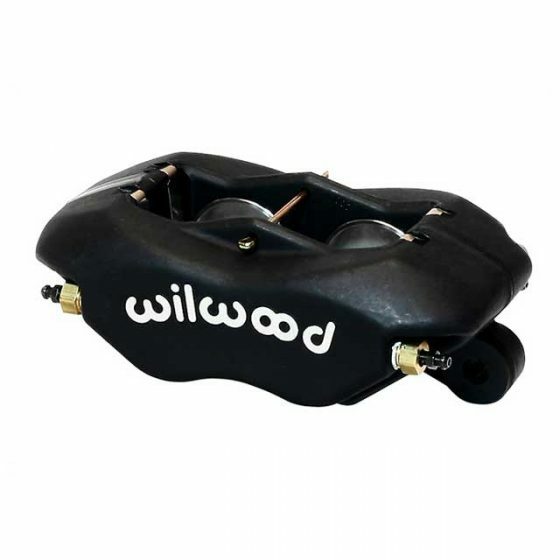 Other standard Wilwood features include high temperature seals and stainless steel pistons to eliminate corrosion and retard heat transfer from the pads. Internal fluid passages eliminate the need for external tubes. Four corner bleed screws assure simple and effective air evacuation from the system and allow one caliper to be mounted in any front, rear, right or left position. 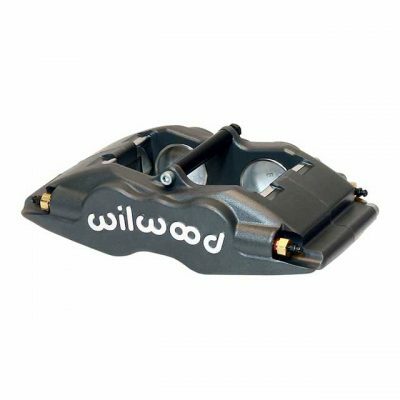 Standard race calipers feature Wilwood’s signature bright black anodized finish to resist corrosion and maintain their high tech style. Polished calipers (shown at right) are also available for custom show car applications. Forged Dynalite calipers are a direct replacement for all Wilwood Dynalite and similar competitive brand calipers with 5.25″ centered mounting lugs. 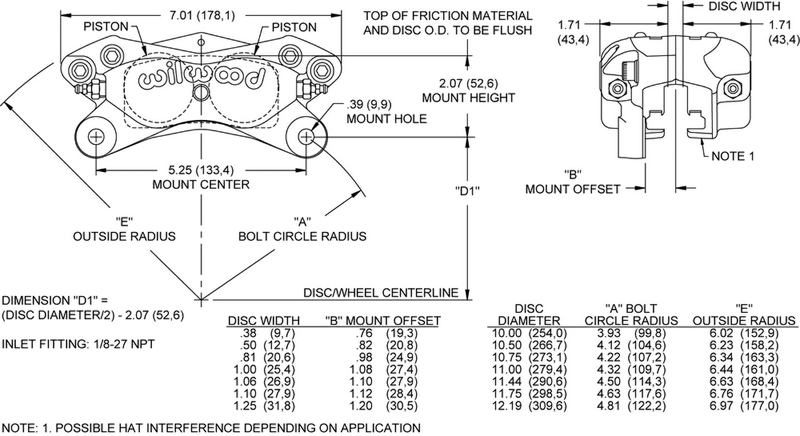 The Forged Dynalite uses the same 7112 type brake pad used in all earlier versions of this caliper. The full range of Wilwood pad compounds is available to match brake response and heat range to any application.